Pantalaimon was put to sleep on the 25th of January. Despite the title, I never had a chance to say goodbye to Pan. I was overseas on holiday. The acquaintance who was looking after Pan and Bentley desperately tried to contact me on my phone. Except she couldn’t. My Blackberry decided it needed a vacation too and shut down its entire software. And because I forgot to bring my seldom-used Blackberry USB cable, I couldn’t restart my Blackberry. So it means I had no chance of prematurely ending my Blackberry’s vacation. In the end, I resorted to using an older LG mobile phone. While not so smart, it was definitely more hardworking. I received a few calls from an Australian number and answered it. But either due to poor reception or LG’s lesser capabilities, I couldn’t hear anything. Within a fifteen minutes span, I got about a dozen repeated calls from the same number. Each time I picked up, there was no sound. I called back but couldn’t get through. I even used my Dad’s Android but it too, was unsuccessful. In the end, I wrote it off as a prank call. The next morning, on 26th Jan, I checked my email and saw that the acquaintance (henceforth shall now be known as “T”) had emailed me yesterday. Two emails, in fact. Most likely giving me updates on Pan and Bentley’s behaviours. Those buggers can be quite a handful at times. Then I saw the email’s header. It was an update. But not the update every pet owner wants. I mean, if the email’s header started off with “URGENT” and followed by “Pan’s sick”, you know something is really, really bad. The first email was about Pan’s critical condition. He couldn’t come off oxygen. The vet told T that there was not a lot she could do for Pan and the only option was euthanasia. T didn’t want to make the decision and wanted to get my approval. I put the pieces together and slowly realized that T was the one flooding the LG mobile with her calls. But we both couldn’t reach each other. So I was oblivious to Pan’s suffering. The second email was sent about an hour later. T went ahead and put Pan to sleep. The vet told T that it was the best decision since Pan was suffering from serious lower respiratory problems. Which means that Pan had either a collapsed lung or a cancerous growth. In short, even with intensive care, Pan’s condition was untreatable. T stayed with Pan till the end and told me that Pan passed away peacefully. I’m grateful that she was with Pan. At least someone familiar was there to comfort him as he expired his last breath from his very brief lifespan. I re-read the emails again, a bit bewildered. I took Pan and Bentley to the vet before I left Sydney in mid-December. Apart from their usual bout of mycoplasma (a lifelong disease that plagued them both), the vet gave them a clean bill of health. Furthermore, Pan was always the healthier one. Most of my time was spent worrying that Bentley might drop dead anytime. There was once Bentley refused to eat because he was depressed, and he was depressed because I was away. I told my housemate to force-feed him baby food if he carried on with his hunger strike. But that’s another story. In the end, Pan was the first to leave. After re-reading the emails again and again and again, I immediately called T. We sped through the usual “hellos” and “how are yous” before T tentatively asked if I’ve seen her emails. I told her I have. “It’s okay,” I said. Somewhere, a thought emerged from my confused brain. What if T mixed up Pan and Bentley? And I guess that was when everything went downhill. The above conversation did not go that smoothly though. I did a lot of “erm-ing” and “uhm-ing” and numerous white sounds. I couldn’t think straight. Even now, I still can’t come to terms that Pan went first. It’s not that I want Bentley to pass on first. It’s just that Pan seemed so healthy and was always the stronger one. Life often deals the unexpected hand. Still, I wonder what went through Pan’s mind when he was on the surgery table. Was he looking forward to getting back home so he can play with Bentley and tussle with him over who get the choicest morsel of vegetable (preferably broccoli)? Or was he just concentrating on trying to get in that precious, precious molecule of oxygen into his scarred lungs? Either way, I have no idea. But I do know that Pan, despite the critical situation, was probably not too upset that I wasn’t there. 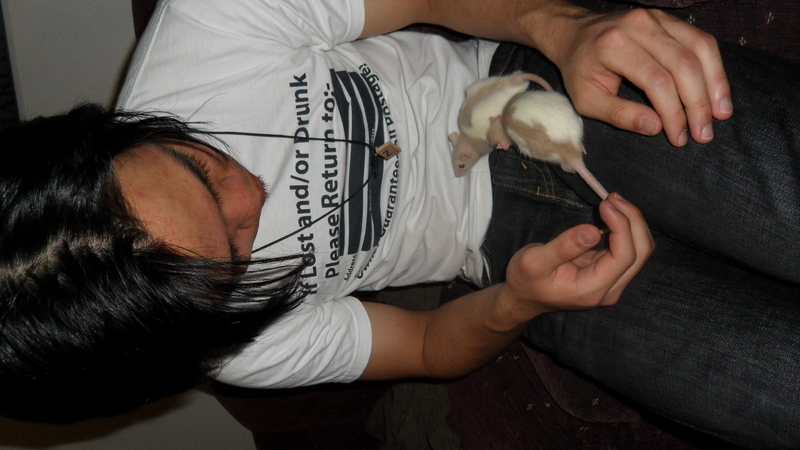 To be honest, Pan and I had a complicated relationship (yes, pet rats and humans do bond together). When I first got Pan and Bentley, I preferred Pan. He had a rather cool and affable temperament. He didn’t panicked when I held him. 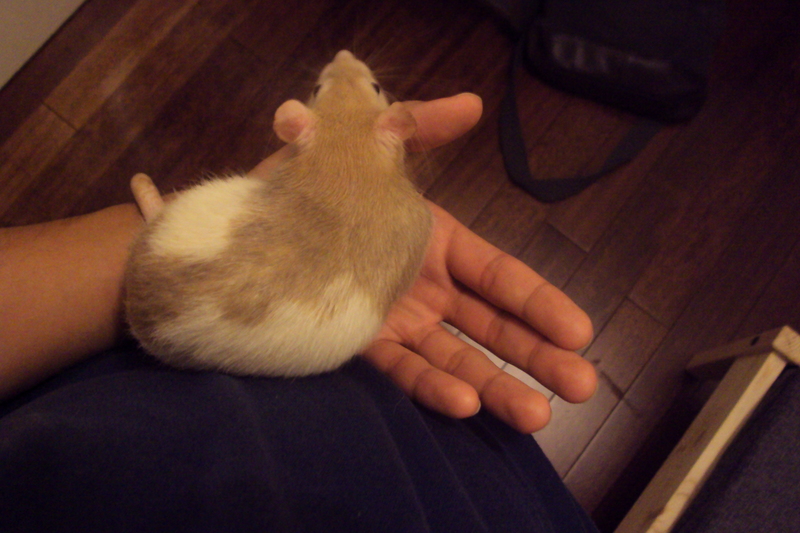 He was always the first one out of the cage to take treats from my hand. Bentley was much more jumpy and much more willing to bite. Pan was gentle and relaxed. He was one chilled rat. But Pan was quite an adventurer too. He was always the first to explore his surroundings. I had a stack of milk crates in my previous apartment and Pan loved climbing them. If there’s one thing that Pan loved more than anything in the world, it was heights. He loved to climb and he was okay with sitting on my shoulder, unlike Bentley. It was also another reason why I bought so many hammocks. Pan loved sleeping on high ground where he can survey his surroundings. But his courageousness also belied a stubborn streak. When I moved to my current place, I let Pan and Bentley run around on my bed. As befitting of his curiosity, Pan jumped off the bed and began exploring my bedroom. I was fine with that as I usually left my door closed. On some nights when I was up late, Pan would climb up my legs and sit on my lap, surveying his surroundings before jumping off and exploring some hidden nook that caught his interest. It went on for a month before I had to put a stop to Pan’s exploring. Pan was chewing most of my stuff. And with Pan’s encouragement, Bentley decided to join in the fun. At one time, they both managed to annihilate my electric beard trimmer. It was one reason why I decided to be clean-shaven. I don’t blame them. Rats are hardwired to chew on stuff. But still… an electric beard trimmer. Bentley stopped jumping off the bed after he received a few scoldings from me. I think Bentley stopped partly because he was much smaller and so had a harder time jumping off the bed, and partly because he was very close to me by then. So he probably felt guilty. Pan’s not stupid, that’s for sure. 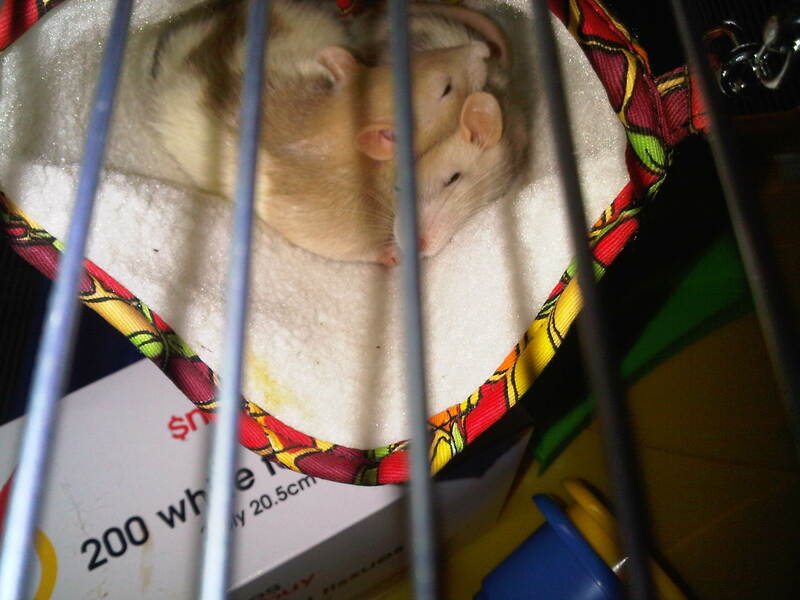 Sometimes, I call them both Pinky and the Brain, with Pinky referring to Bentley and the Brain referring to Pan. I think the reason why Pan had such a strong stubborn streak was because he very smart. In his worldview, I was just a big rat that fed him, bathed him and provided him with all the necessary comforts. I was basically a rat butler to him. So Pan felt very offended each time I caught him jumping off my bed. In a way, he thought it was his right to explore the very area the three of us inhabited and that I was taking away his right. Weeks after weeks, I would picked up Pan and scold him whenever I found him running on the floor. Weeks after weeks, he would jumped off the bed the moment I let him out of the cage. In the end, I decided to play the hard way and only let Bentley out to play. It was only after fifteen minutes later would I let Pan out. 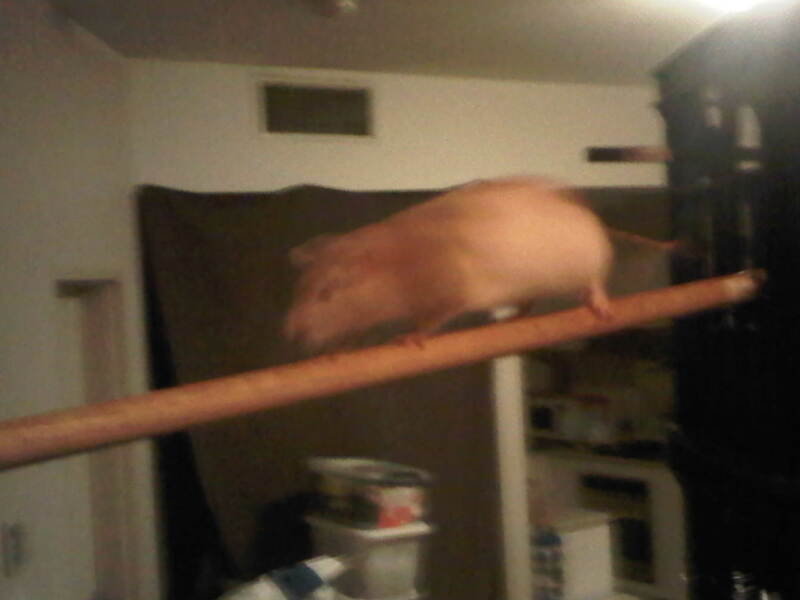 But Pan still persisted in jumping off my bed. I thought it would never end. I can’t remember when it was, but I think around May or June last year, Pan finally got the hint and stopped jumping off my bed. It took almost three months. The other reason why Pan stopped his intrepid exploring was that he got less active. While he still liked running up and down my bed, I noticed Pan started sleeping more. Bentley retained his usual hyperactive self. But Pan, already one chilled rat, became even more chilled. I’m not sure if he knew what was coming or if it was just old age catching up with him. The funny thing about Pan is that despite his laidback attitude, he had a strict no-cuddling policy. Pan will tolerate me holding him, but not for more than five minutes. And God forbid I should ever cuddle him like the big fur-ball he is. Even when I let Pan and Bentley sleep on the bed with me, Pan will choose to sleep at my feet. When he’s feeling generous, he’ll splay himself over my feet. But no more. Bentley, on the other hand, will sometimes sleep on my chest or curl up near my face. There was one time though, where I did manage to make Pan sleep beside me for fifteen minutes. 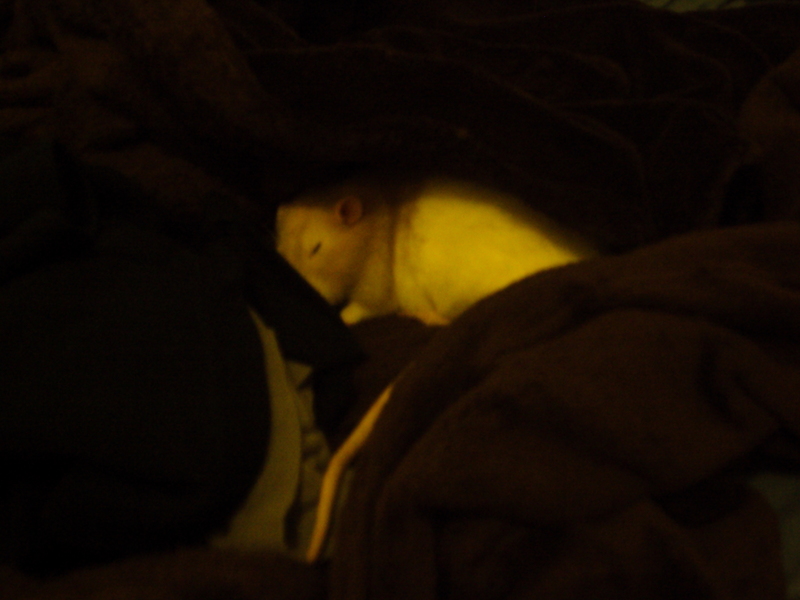 I was on my bed reading a book and noticed that Pan had buried himself deep within my blanket. Afraid that he might unwillingly suffocate himself, I peeled off the layers of blanket, scoop him up, and lay across my chest. With my left army encircling him, Pan peacefully snoozed while I continued reading my book. At first, I thought it was a fluke. But then three minutes passed. Four minutes. Five minutes. Six minutes. Seven minutes. Pan continued his peaceful slumber. So I continued reading my book with Pan curled up on my chest. It was the most peaceful fifteen minutes we had together. Then Bentley bounded over with a “HEY GUYS WHAT’S UP” expression on his face and shook Pan awake. 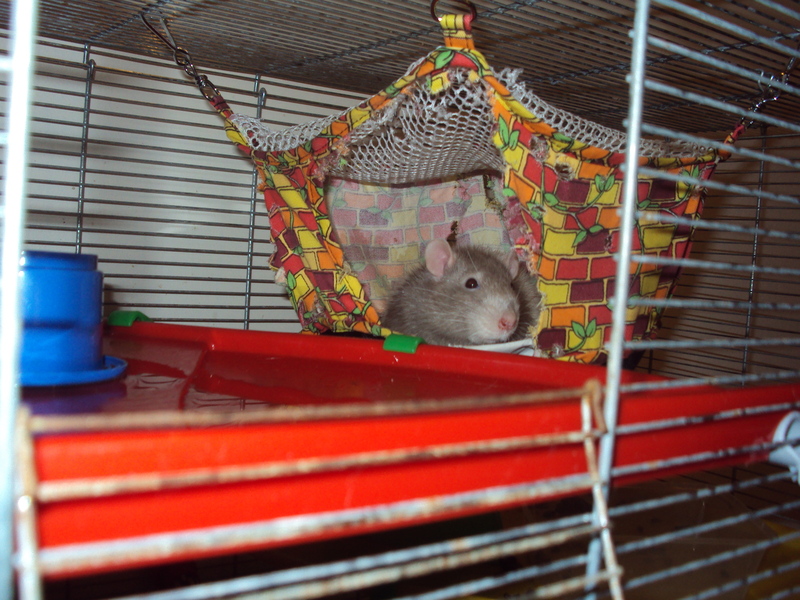 Pan was a little miffed and went back to cage to sleep on the hammock. That was one of the few times Pan allowed me to have prolonged close contact with him. But for all his stubbornness and independent streak, without Pan, I would never be able to calm Bentley. In the beginning, Pan taught, or rather demonstrated, to Bentley that I was not going to hurt them. Instead, I was to give them the life of nobility and be their lifelong butler. Without Pan, the extremely close bond between Bentley and I would probably not have existed. Unfortunately, I’ll have to bid Bentley goodbye too. It’s not because Bentley’s sick. It’s because of Pan. Pan and Bentley have been together since birth. They were litter brothers. 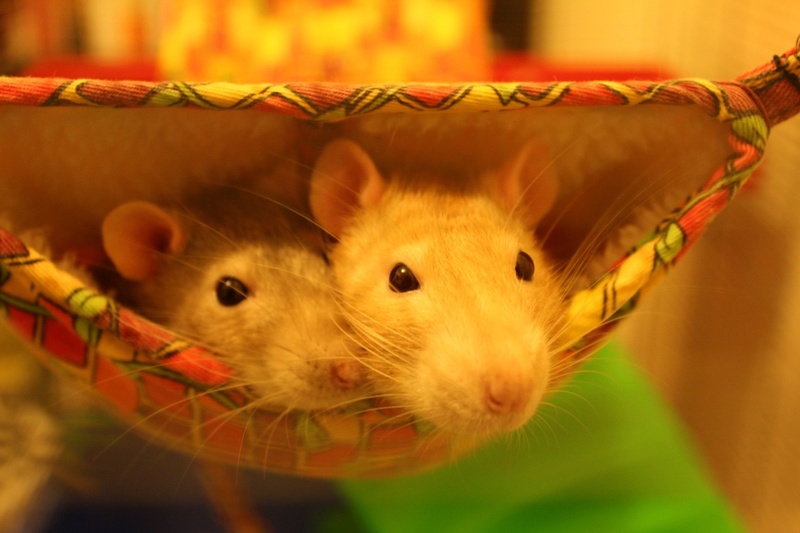 On top of that, rats are social creatures and need to have some rat companions. 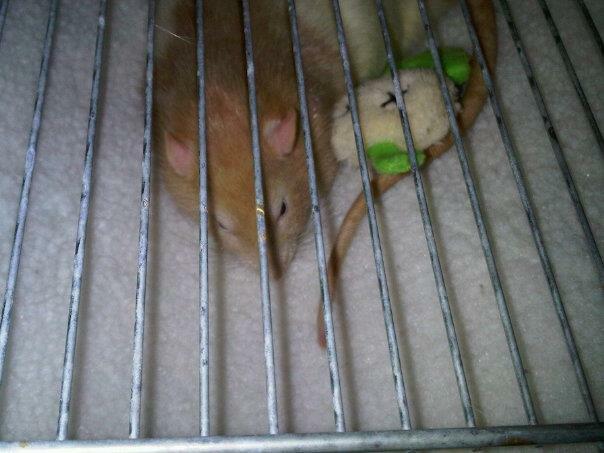 Although Bentley and I are very close, I cannot leave Bentley alone in the cage without any rat friends. So get more rats then! Well, the thing is, I’m not going to get any more rats. I don’t think I can handle another heartbreak of watching another bunch of rats dying from their brief lifespan. I had Pan and Bentley for a year and already, I feel that a tiny part of me had died when Pan passed on. 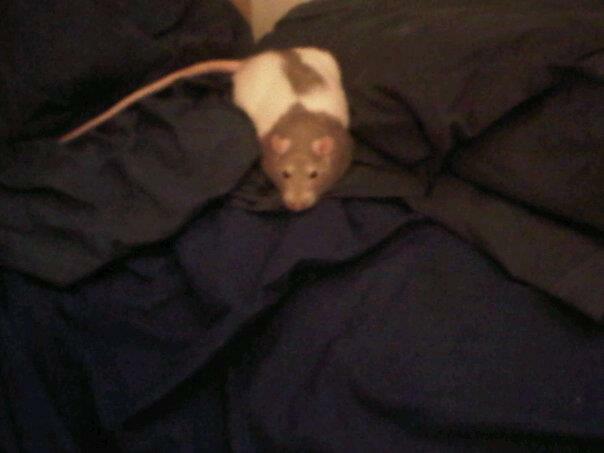 As much as I want to take Bentley back, I cannot let him lived out the rest of his life as a lonely rat. It would be selfish on my part and a torture for Bentley. So I asked T to adopt Bentley. She has two rats herself and Bentley had been with them for a month and half. Even with Pan gone, at least Bentley still has other rat companions to play with. T was happy to adopt Bentley but told me that I could have Bentley back anytime I wanted. In a few days, I’m going to see Bentley for the last time to let him know that I didn’t forget him and to see that he’s settling down. I may not be with Pan for his last moments, but the least I can do is to make sure Bentley is happy for the rest of his days. As usual, doing the best thing for your pets means going through a personal sacrifice. I knew what I signed up for when I got Pan and Bentley. But I guess I dealt with it flippantly until it came for the actual sacrifice to take place. Even with my severe hearing loss, I feel an immense silence in my room. Sometimes, I can still feel Pan and Bentley’s presences, their tiny feet pattering as they walk and climb around the cage. Sometimes, I turn around and see the empty table where their cage used to occupy, only to feel a sense of emptiness inside me. But like some people say, this too shall pass. Until then, Pan will be living in place where a carbon copy of my bedroom exists. A bedroom where there’s no cage and where he can jump of the bed, run on the floor, climb milk crates, chew on beard trimmers, nibble on carrots and broccoli, and sleep on hammocks while he waits for Bentley. My favourite photo of Pan. I took this after I had a nightmare where he lost half his face. I wrote a post on this. Look at the smirk on his face. Bentley takes over the hammock watch. When we were still in the previous apartment. At that point, Pan liked using Bentley’s head as a pillow. Later on, they switched roles. As per his strict no-cuddling policy, Pan hated the stuffed toy. He would always push the toy into the litter pan. Only Bentley was allowed to cuddle with Pan. Pan and his gravity-defying crossing. I first posted this picture on my blog here. Pan surveying my bedroom floor. Pan making himself comfy in my blanket. I’ll definitely miss Bentley’s grooming. And I’ll miss him waking me up. Bentley chilling on my pillows. The first day I brought them home. Last, but no least, the best photo taken of them. A high school friend who was visiting me snapped this photo of them. Bentley is on the left, while Pan is on the right. Other blog posts about Pan and Bentley: Post 1 (the very first post), Post 2 and Post 3. This entry was posted in Deep Rants, Rats, Sydney and tagged fancy rats, pet death, pet euthanasia, pet owner, pet rat, pet rats, pets' death, putting pet to sleep, putting rat to sleep, rat, rats by Zareth. Bookmark the permalink. Sad story man!! My condolences! Keep making it halal mate! I will always support ya! Im so sorry for the loss of your beloved Pan. Boy, do I know the drill with mycoplasmosis. I’m just so very sorry you couldn’t be there to be with him when it was time for him to go. 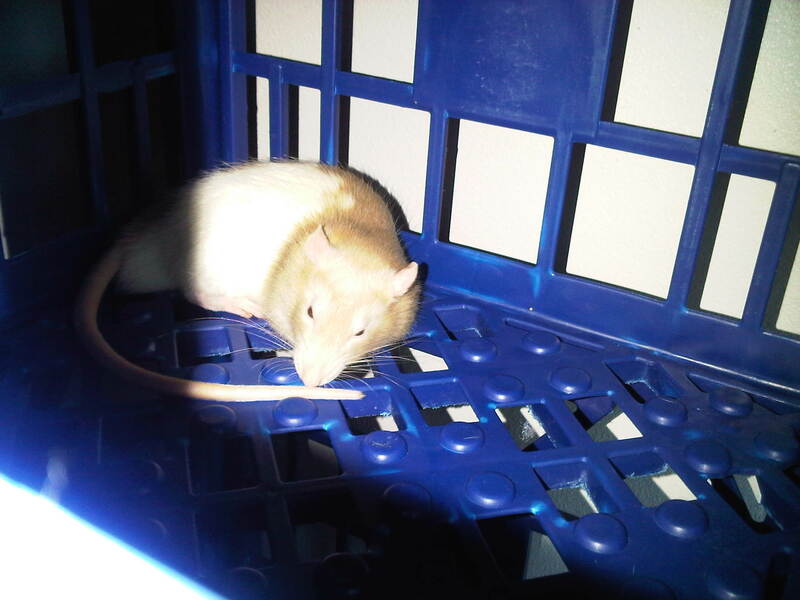 I’ve included a link to a post on my own site dealing with some of these issues and mourning pet rats in general. I hope you find it interesting, if not helpful. I’m sure a lot of the same things went through your mind. The second is a post about what happens when you DON’T elect to euthanize with mycoplasma, as I found to my sorrow last winter. Your friend so totally did the right thing! 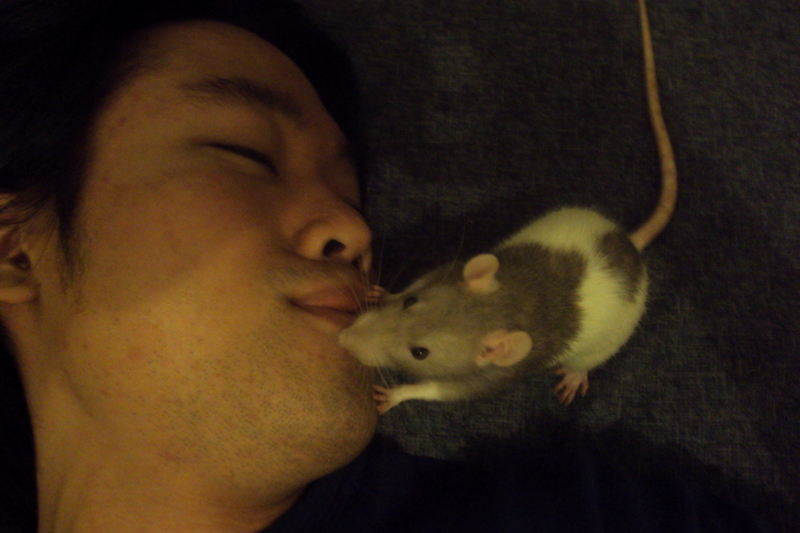 It’s clear how much you love(d) your rats. I hope when the time is right you’ll adopt another pair. 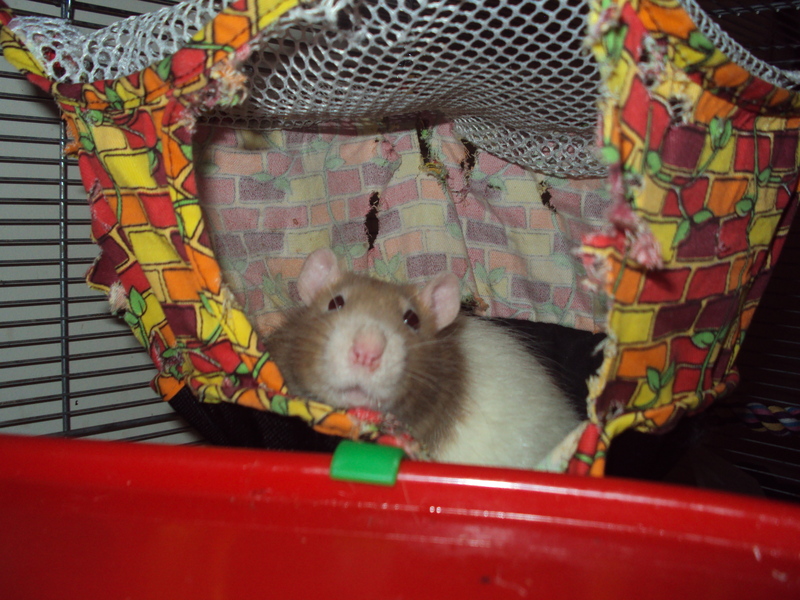 There are so many great rats out there in need of homes as good as yours obviously is. I am actually crying after reading this, and I am so sorry you had to say goodbye to your boys. 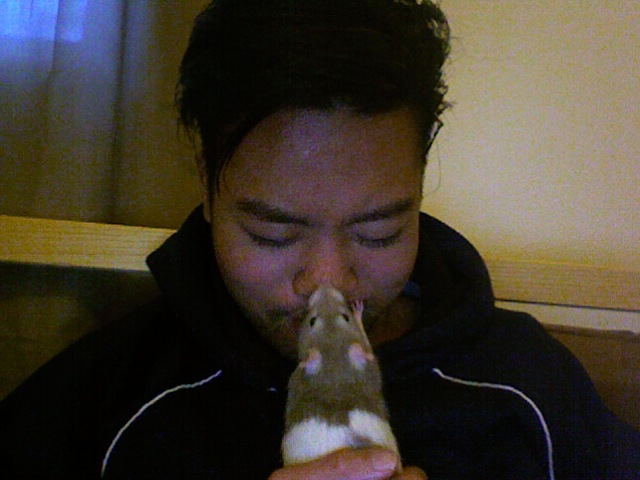 I never thought anyone could love a rat as much as I love mine, but I think you just might come close. 🙂 Thank you for loving them and for sharing this story. I wish there were more people like you in this world.